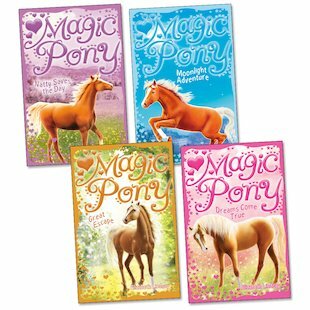 What’s even more spellbinding than a magic pony? Four of them in one glorious bargain pack, with oodles of enchantment in each one! Natty has always longed for her very own pony. But all she can do is dream … until the day she visits Cosby’s Magic Emporium. In the shop, she buys a poster of Ned, a handsome chestnut pony – and when the poster comes alive, Natty finds herself face to face with a real live pony! Join Natty and Ned on their first four unforgettable adventures in this stunning quartet. Download this pretty Magic Pony poster to brighten up your room.